After this thought-provoking session, I too pondered academic medicine’s fate. I would like to share my reflections in this forum. Without question, technology stood out as a major theme in this conference. And for good reason: clearly it is already permeating every corner of our academic medical lives. But as technology outpaces our clinical and educational methods, how exactly will it affect our practices in providing care and in training physicians? Our educational systems will evolve in ways we cannot predict. But in reality, the future is already here as transformations are already afoot. MOOCs — massive open online course for the uninitiated — like Coursera are already providing higher education to the masses and undoubtedly will supplant lectures in med schools and residencies. In a “flipped classroom” era, MOOCs will empower world renowned faculty to teach large audiences. Meanwhile, local faculty can mentor trainees and model behaviors and skills for learners. Dr. Shannon Martin, a junior faculty at my institution, has proposed the notion of a “flipped rounds“ in the clinical training environment, too. In this model, rounds include clinical work and informed discussions; reading articles as a group or having a “chalk talk” are left out of the mix. In addition, medical education will entail sophisticated computer animations, interactive computer games for the basic sciences, and highly intelligent simulations. Finally, the undergraduate and graduate curricula will have more intense training in the social sciences and human interaction. In a globalized and technologized world, these skills will be at a premium. But why stop at flipped classrooms or even flipped rounds? Flipped clinical experiences are coming soon too. Yes, technology will revolutionize the clinical experience as well. Nowadays, we are using computers mainly to document clinical encounters and to retrieve electronic resources. In the future, patients will enter the exam room with a highly individualized health plan generated by a computer. A computer algorithm will review the patient’s major history, habits, risk factors, family history, biometrics, previous lab data, genomics, and pharmacogenomic data and will synthesize a prioritized agenda of health needs and recommended interventions. Providers will feel liberated from automated alerts and checklists and will have more time to simply talk to their patients. After the patient leaves the clinic, physicians will then stay connected with patients through social networking and e-visits. Physicians will even receive feedback on their patient’s lives through algorithms that will process each patient’s data trail: how often they are picking up prescriptions, how frequently they are taking a walk, how many times they buy cigarettes in a month. And of course, computers will probably even make diagnoses some day, as IBM’s Watson or the Isabel app aspire to do. Yet even if Watson or Isabel succeeds in skilled clinical diagnosis, these technologies will not render physicians obsolete. No matter how much we digitize our clinical and educational experiences, humans will still crave the contact of other humans. We might someday completely trust a computer to diagnose breast cancer for us, but would anyone want a computer to break the bad news to our families? Surgical robots might someday drive themselves, but will experienced surgeons and patients accede ultimate surgical authority to a machine? A computer program might automatically track our caloric intake and physical activities, but nothing will replace a motivating human coach. With all of these changes, faculty will presumably find time for our oft-neglected values. Bedside teaching will experience a renaissance and will focus on skilled communication. Because the Google generation of residents and students will hold all of the world’s knowledge in the palm of their hands, they will look to faculty to be expert role models. Our medical educators will be able to create a truly streamlined, ultra-efficient learning experience that allows more face-to-face experiences with patients and trainees alike. So where is academic medicine headed beyond Flexner? Academic physicians will remain master artists, compassionate advisers, and a human face for the increasingly digitized medical experience. Paul Bergl is an internal medicine physician who blogs at Insights on Residency Training, a part of Journal Watch. Nurses are an essential part of the medical system and patient care–so why shouldn’t they be more involved in developing new healthcare IT? In the U.K. and the U.S., nurse leaders must justify their requests for resources. The value of technology is determined by how it is used and whether it helps or hinders care. The U.S. and U.K. share similar goals for technology innovation, but differ when it comes to economics and delivery. Frontline staff often is not involved in the planning and implementation of health IT. One example of how the perception that nurses are slow to adapt to technology is proved wrong is in nurses’ work in neonatal or intensive care units, the article argues. Such a belief keeps technology system suppliers from understanding the practicalities of nursing care and how they can support innovation in everyday practice. To say that the impending revision of the International Coding of Diseases will significantly increase the variety and detail of coding is putting it mildly. Learn how this will directly impact your organization’s outcomes and reimbursement. Register Now! Organizations have tried adding new systems instead of integrating existing ones, and many have been implemented without considering whether they’d increase workloads, change practices or be acceptable to patients, the article argued. To that end, it said, it is important for nurses to respond to how hospitals and health systems speed up adoption of technology to support practice–and see technology as solutions for meeting needs. In one instance of successful technology implementation involving nurses, electronic monitoring helped to dramatically improve hand hygiene among nurses in Canada, according to research published in August in the journal Computers, Informatics, Nursing. That same month, it was reported that home self-monitoring with the support of a remote care nurse is effective in empowering patients with chronic illness in their own healthcare, according to a study published in Telemedicine and e-Health. their levels of health spending. IOM reports provide objective and straightforward advice to decision makers and the public. This site includes IOM reports published after 1998. A complete list of IOM’s publications, from its establishment in 1970 through June 30, 2013, is available as a PDF. The 2010 opening of the Captain James A. Lovell Federal Health Care Center (FHCC) created a joint entity between the Department of Defense (DoD) and the Department of Veterans Affairs (VA) and replaced two separate centers in North Chicago. VA and DoD leaders envisioned a state-of-the-art facility that would deliver health care to both DoD and VA beneficiaries from northern Illinois to southern Wisconsin, providing service members and veterans seamless access to an expanded array of medical services. The DoD asked the IOM to evaluate whether the Lovell FHCC has improved health care access, quality, and cost for the DoD and the VA, compared with operating separate facilities, and to examine whether patients and health care providers are satisfied with joint VA/DoD delivery of health care. In the mid-Atlantic region of the United States, an effort is under way to get insurers, providers, employers, and unions to cooperate in creating a system that can reduce total health care costs and premiums while achieving better outcomes. Our organization — the Institute for Healthcare Improvement — is assisting because we believe that this kind of regional initiative is the most promising way to move the U.S. to a system that achieves the “Triple Aim”: better care for individuals, better health for populations, and a lower per capita cost. Because the effort is still in the early stages, the parties are not ready to be identified. But we can say that the largely low-wage, multilingual workforce in question has had to give up pay increases in recent years in order to cover the rising cost of health benefits. This prompted a local labor-management trust fund to begin to consider a new approach: one in which players in the local heath care system address the challenges from the perspective of their region as a whole. To this end, they are using data about costs, outcomes, and practice patterns to identify underlying problems and create new system solutions. This article offers a framework that players in other regions can use to cooperate and fix their own health care systems. Not surprisingly, it has not been easy for the organizations involved in the mid-Atlantic region to make progress. A collaborative project with a health care provider to tackle patients with complex illness has had an uneven course, with some early wins offset by relationship challenges. A coalition with a local employer has been formed, but it is taking time to develop an implementable model of something truly new. Each small success, however, is helping to build a foundation for a system that will focus on the people who should matter the most: workers and their families. One of the best-kept secrets in the United States is that workers pay almost all of the costs of their health care. They do so through employee contributions to premiums, out-of-pocket payments for services, a shift of compensation dollars from wages to benefits, and state and federal taxes such as the payroll tax that supports Medicare. But instead of serving workers’ best interests by trying to give them the best care at the lowest cost, insurers, providers, employers, and unions act like adversaries. Insurers leverage their purchasing power to exact discounts from providers and their administrative power to reduce benefits. Dominant providers leverage their market position to raise prices independently of cost or quality. Employers leverage their power in labor markets where workers have limited job options to extract higher deductibles and out-of-pocket payments from employees. Unions, which now represent a tiny share of American workers, resist to the extent they can. The numbers spell out the sorry result. 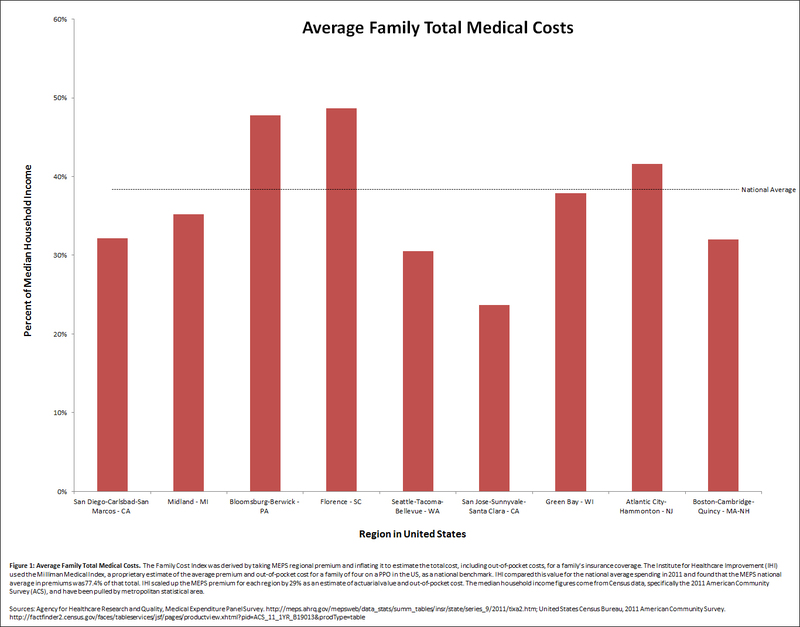 On average, family premiums and out-of-pocket costs are about 40% of median household income (and even more if the payroll tax for Medicare is included). Meanwhile, health care outcomes for the population as a whole are improving at a rate far slower than premiums are increasing. This continuing transfer from wages to health care does not reflect better value for money. To get on to the pathway to lower total costs with better outcomes like the parties involved in the mid-Atlantic region are trying to do, players in other regions must understand that they are in a common system with a common pool of limited resources and that separate, zero-sum strategies are destructive. With that in mind, they must seek four changes. The goals should reflect the Triple Aim articulated by the Institute for Healthcare Improvement — again, better care for individuals, better health for populations, and a lower per capita cost. Each should be measured, reported transparently, and tracked over time. The metrics of per capita cost should include health care premiums paid directly by the wage earner and indirectly by the employer from the compensation pool as well as payroll taxes to support Medicare. Goals should include a mutually agreed distribution of the risks and benefits of cost reduction among all actors. Lack of transparency stifles competition based on real value and encourages leveraging strategies. Shared measurement systems and unprecedented and complete transparency about costs and outcomes will help build trust among former adversaries. Key to trust is an agreement in advance on consequences when cost and outcome goals are not met. This is hard work and failure will happen; therefore, it is essential to test ideas on a small scale and increase the scope of the system change as trust builds and we gain confidence. All actors will need to develop business plans compatible with the agreed premium-reduction goal to allow everyone to succeed in a system that costs less. Such plans may include revenue enhancement by attracting more patients or members from competitors; sharing savings; increasing productivity through care redesign that allows more people to be helped with the same resources; and contributing to non-health-care jobs and economic development to sustain or grow the pool of commercially insured patients. Both competition and cooperation can help but only if each is used where appropriate. Cooperation should dominate in goal setting, administrative simplification, measurement and transparent reporting of costs and outcomes, community-based prevention, public education, learning systems for care innovation, and planning of elements of care for which it is technically best to have only one supplier. If costs and outcomes are transparent, competition among some clinical specialists, chronic-disease-care managers, and highly specialized services may be a good thing. But in the many communities that have and need only one dominant health care system anchored by a hospital, it is far better for the players in the region to focus on improving the design of the overall system and reducing premiums through cooperation than attracting new (unneeded) specialty and tertiary care providers to enter the market. To make this work, it will take external pressure from employers and unions in the region to keep the health system focused on the Triple Aim. Since wage earners finance care, they should receive the lion’s share of the resulting savings — in the form of increased wages, job security, or enhancement of non-health-care benefits. It is only fair that the new system not only provide better care at lower cost but also return the money saved to those from whom it came. Lindsay A. Martin is an executive director and improvement advisor at the Institute for Healthcare Improvement, where she focuses on innovation and system-wide improvement. Donald Berwick, MD, is president emeritus and a senior fellow at the Institute for Healthcare Improvement and the former administrator of the Centers for Medicare & Medicaid Services. Leaders in the healthcare community are thinking of ways they can use data to improve the quality of health care. The departments of Veterans Affairs and Defense have joined forces to create VistA Evolution, a system that allows the exchange of electronic health records information between the two. Dr. Theresa Cullen, chief medical informatics officer at the Veterans Health Administration and the head of this initiative, discussed the next steps in this process in an interview with Federal News Radio’s Emily Kopp at AFCEA Bethesda’s sixth annual Health IT Day. She described that process as a stair step. Making matters more difficult is the fact that the entire U.S. healthcare arena is switching over to the 10th version of the International Classification of Disease (ICD-10), which most of the world is already using. The standard to date has been ICD-9, which is what the U.S. health care industry has been coding in. Another classification system, SHOWMED-CT, is even more granular and that’s where Cullen says the healthcare profession should be heading. A lot of the work VHA is doing recognizes a continuum of care that is critical for VA’s patients.